This dandelion honey was originally known as poor man’s honey. It’s made from dandelion flowers and sugar rather than something that’s been produced by bees. Although it may not be true honey, however, it really does look and more importantly, taste like honey. It’s also eminently suitable for vegans. I remember reading about dandelion honey a couple of years ago on a blog, but couldn’t remember which one. I saw it again last year on someone else’s blog but again couldn’t remember where. After enquiring via Twitter, I found out one of the blogs I’d seen it on was Elizabeth’s Kitchen Diary, but by then it was too late and I’d already cobbled together a recipe from several I found online. This mixture of dandelions, sugar and lemon juice is purportedly meant to taste like honey. Well that was a claim that had to be tried to be believed. Our plot was covered in a riot of glorious yellow dandelions. They were clean, organic and I didn’t want them to seed all over the vegetable beds. I love getting these unintended additional crops from the plot. We’ve had quite a few nettles and wild garlic so far this year, but that’s as far as our foraging has gone. All of the instructions I saw said to pick out the dandelion petals and use these on their own or it would turn the colour a rather mushy brown and make the dandelion honey taste bitter. There was no way I was going to spend hours doing that, so I used the whole flower head and hoped for the best. Astonishingly, it worked. The result was a wonderful dandelion honey that not only had the consistency of runny honey, but really tasted like it too. Despite leaving the green bits on, the bitter notes were faint and the colour was still golden rather than muddy. I’ve used it in several recipes already including this Figgy Bread. It works a treat in my easy vegan honey almond granola too. Now I know how simple it is, I shall be making this again next year. 18 April 2015 Update – I’ve just made dandelion honey for the 3rd year running and I’m as enamoured now as I was back in 2013. This is a poor man's honey made from dandelion flowers and sugar rather than made by bees, but although it may not be true honey, it really does look and more importantly, taste like honey. It's vegan too. Simmer dandelion heads and lemon in water for 20 minutes in a covered pan. Pour into a glass bowl and cover. Leave to steep overnight. Pour through a sieve extracting the liquid by pressing down with a spoon to make about 750ml. Discard the flowers and simmer the liquid in a pan with a similar quantity of sugar for about 45 minutes or until the mixture becomes syrupy and drips slowly off a spoon. Pour into two warm sterilised glass jars and leave to cool. Ideally, all green parts of the dandelion flower would be removed to avoid bitterness. I have never done that as it's just too time consuming and I'm happy with the result. Requires foraging for dandelions and overnight soaking. Dandelion is a wonderful herb. I often dig up the roots to make dandelion coffee. The leaves of the wild dandelion, I find too bitter, but some are happy to use them as salad leaves. There are myriad health benefits, but it is best known as a cleansing spring tonic. I am submitting my dandelion honey to Karen’s Herbs on Saturday over at Lavender and Lovage. It’s hosted this month by Anneli at Delicieux. As this dandelion nectar is not only made from scratch, but is also picked from scratch, I am submitting it to Javelin Warrior’s Made with Love Mondays. 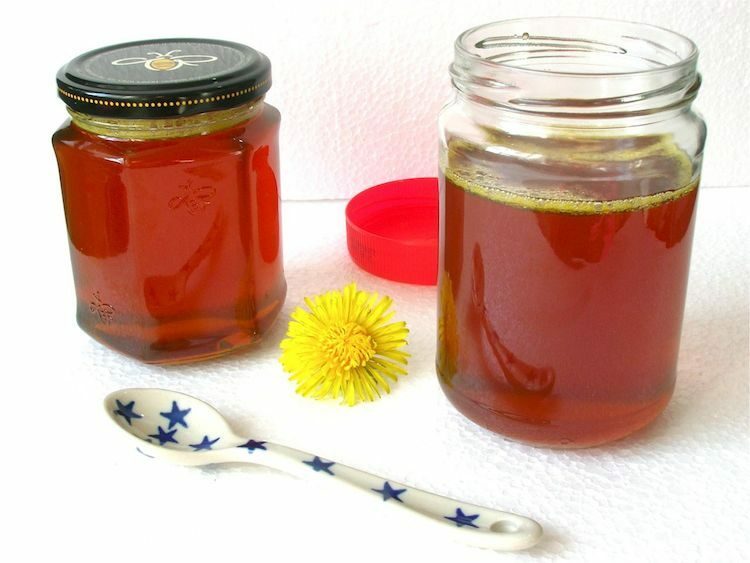 Dandelions are in full season this month, so I’m entering this vegan honey into Simple and in Season with Ren Behan. Thanks for visiting Tin and Thyme. If you make this dandelion vegan honey recipe, I’d love to hear about it in the comments below or via social media. Do share a photo on your favoured social media site too and use the hashtag #tinandthyme, so I can spot it. For more delicious and nutritious recipes, follow me on Twitter, Facebook, Instagram or Pinterest. I’d never heard of dandelion honey before but it sounds quite tasty. I don’t have a garden or any outside space to call my own. But this is something I’ll remember to try in the future when we do get a place with a garden. Thanks very much Alexa. Making dandelion honey is worth making at least once, just for the fun of it. I’m making this for the second year. I have an alottment which is organic and there are riots of dandelions. The bees won’t miss one jar. It was delicious on home made bread, toasted. I’m going to use it in recipes requiring honey this year. It’s brilliant stuff and great for cooking too. We moved last year and consequently lost our plot on a field which was totally organic. That’s where I used to get all of my dandelions. Feeling a bit stumped now. Wow I have never thought about making honey before but it looks great! Aw, thanks for the link back 🙂 I’m so glad you’ve made, tried and enjoyed this! I really ought to get more organized and make some again this year. I have a recipe for dandelion honey parfait I’m just dying to try! How interesting. I suppose that’s a vegan way of making honey. Also, having just read this post, I clicked through a coupld of links from another page and ended up at this post on Lilac Honey . I know it uses actual honey, but I wonder if you could use Lilac in the same way as the Dandelion? I had no idea that Lilacs were edible anyway. It seems I have stumbled across a whole new world. Thanks! Lilic must be the flower of the moment. I had no idea about using lilac in cooking either until recently, but I’ve just seen a whole spate of lilac syrup and lilac sugar posts – now I just need to find a lilac! Will check out the lilac honey post first though. What a great idea. I’ve tried dandelion coffee but not honey. I’ll have to give this a go! Darn! The dandelions in my garden have already seeded so I shall wait for the next crop of flower to try this recipe because I am intrigued! I have been weeding it mercilessly this year, so don’t have enough for any cooking. Looks fab! This is amazing! I hate the dandelions that grow in my lawn, but to think I could pull them up and make them into yummy honey! Inspired! Well, I’ve eaten the leaves before but this is definitely an intriguing variation. It seems to have been a remarkably good year for dandelions and usually that’s not a good thing. what a simply glorious idea!… I love the idea of this so utterly that I MUST make this when I get home, if i’m not too late! Alys Fowler swears by her dandelion fritters which I think sound wonderful too. Maybe it’s time for a dandelion revolution! Huh, I’ve never heard anything like that before. Good on you for giving it a go. You always manage to surprise me. Wow – now that is something new. Who knew? I have never cooked with dandelions. They’re in short supply here in Dubai! Must be adventurous this summer in the UK. A toast with honey. That’s a perfect way to start your day. Apart from its great taste, honey has lots of health and nutrition benefits. Sounds intriguing. I use found food a lot at this time of year, with dandelions in smoothies the easiest by far, but also putting them in fritters too. I have yet to try dandelion honey but it may need to be made, what with the wet weather supplying so many! Ah, if only I’d seen this before all of my dandelions went to seed! When we first moved house my mum used to tell my brother and I to pick the dandelions – we got a penny for each flower and 2p for a seed head, provided we got all the seeds into the bag. There were a lot and a lot of dandelions and it was her way of bribing us to help stop them spreading! Fantastic…. but now I live thousands of miles away and there are no dandelions! Drat! Oh, I’m so glad that you used the whole heads. I picked about a kilo of flowers, thinking I was going to do wine, but my wine making kit is elsewhere. I wasn’t looking forward to picking off all of the petals from them. Thanks for the tip on Twitter. I’m already thinking about what I can make with this (mine is about to get simmered down with the sugar). If you want to eat dandelion leaves, try forcing them by placing a teracotta pot on the young plant, and newspaper over that to block out the light. Then the leaves grow pale, like forced asparagus or chicory. Much more tender, too. Or you can cook them. I make a mess of greens with dandelions and nettles, which is good. Never heard of this before, but certainly going to give it a go because sometimes I feel honey a little too rich so this might be a good alternative. Interesting point Rhian, I’d not thought of honey as being rich before, but now I think about it, I can see what you mean. I’m definitely going to make this once there are enough dandelions, they are just starting to flower now and we will soon have plenty. Our plot is completely covered in them – don’t think I made even a tiny dent in them Janice. I hope it thickened up for you Dawn. I’ve never had a problem and each time I make it I’m impressed with the flavour all over again. Would very much appreciate a link. It’s very easy to do. Vegan honey for the win! I have already made dandelion jelly this year, and am waiting on my brewers yeast to arrive so i can make dandelion wine. In the meantime, I made this dandelion honey recipe (in addition to the lemon, I used half an orange). Its fantastic! Thanks for sharing! Ooh dandelion wine sounds good Jenny. As does dandelion jelly. Glad you liked the honey and now I’ve read this, I might just have to try adding orange next time I make it.